Lara is a residential town set in rural surrounds between Melbourne and Geelong, north-east of Geelong across Corio Bay. It is situated on Hovells Creek, which drains into Limeburners Bay which is an indent on the Corio Bay coastline. 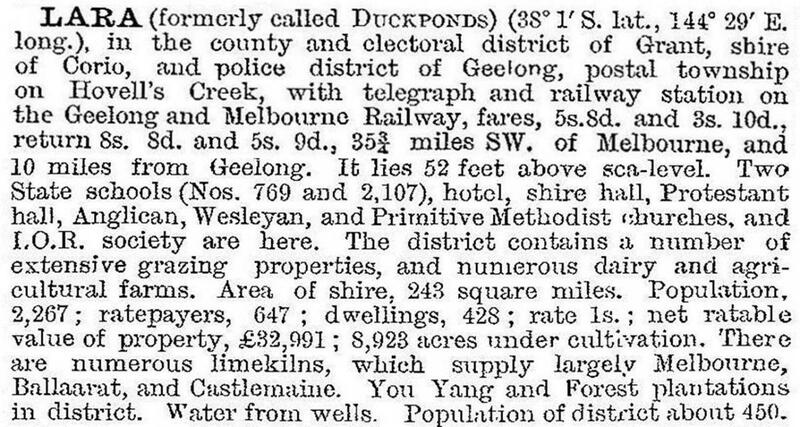 The Melbourne to Geelong railway (1857) passes through Lara and the Princes Freeway skirts the town's southern boundary. On the other side of the freeway there is the Avalon airport. The explorers Hume and Hovell arrived at Lara on 16 December 1824, believing that they had reached Westernport Bay. They recorded that the Aborigines described the bay as Jullong and land as Corago, suggesting origins for the names of Geelong and Corio. Hovells Creek was first called Duck Ponds Creek when the area was settled in the 1840s, and the place where Lara was laid out was known as Duck Ponds. The name accurately described the nature of the waterway and the plentiful fowl found there: the town had a lake of about 15 ha. However, a plan for the village in 1853 named it Lara, and the names co-existed with the Hovells Creek post office until the 1870s. The school which was opened in 1866 was called Lara Lake, the railway station was Duck Ponds (and most gazetteers agreed with that name), and the colonial government decided on Hovells Creek in 1872. Two years later, after local petitioning, the name Lara was settled on. It is thought that the name is derived from an Aboriginal word meaning stone or building of stones. Adjacent to Lara there were also village subdivisions named Cheddar and Swindham, but these are now subsumed by Lara and Lara Lake. The first church in Lara was built by the Primitive Methodists in 1854.The more substantial Holy Trinity (Anglican) church was built in 1877, but substantially destroyed by the 1969 grass fire. Lara was the administrative centre of Corio Shire from its formation until the opening of new offices in Geelong North in 1937. The Lara RSL took over the shire hall. Lara township has a Brotherhood of St Laurence residential estate, two State primary schools and a Catholic primary school (1983), a State secondary college (2003), a growing residential area, three reserves near the town centre, the wetlands and small linear reserve. A drive-in shopping centre west of the railway station has been supplemented by another group of shops near the Lara hotel, east of the station. Out of town there is the Elcho Park golf course and recreation reserve, and the Serendip Wildlife Sanctuary and Pirra Arts Centre. The golf course is part of the former Elcho estate, its homestead (1867) being on the Register of the National Estate. Likewise, Pirra homestead (1886) is also on the register. The maximum security Barwon Prison (1990) for males is located about 6 km north-west of Lara. The 2006 and 2011 census areas measured about 20 km from north to south and 15 km east to west. Most of the population is in the south, and the north includes the You Yangs regional park.